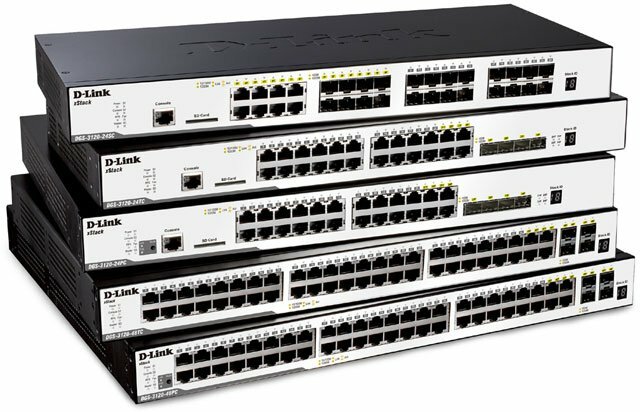 The D-Link DGS-3120 xStack Series are enhanced L2 access stackable switches designed to connect end-users in a secure SMB or enterprise network. These switches support physical stacking, multicast and enhanced security, making them an ideal Gigabit access layer solution. The DGS-3120-24TC/48TC provides 20 or 44 10/100/1000 Mbps Gigabit Ethernet ports and 4 combo 1000BASE-T/SFP Gigabit Ethernet ports. The DGS-3120-24PC/48PC provides 24 or 48 10/100/1000 Mbps PoE Gigabit Ethernet ports and 4 combo 1000BASE-T/SFP Gigabit Ethernet ports. Each 10/100/1000 Mbps port of DGS-3120-24PC/48PC supports 802.3af and 802.3at Power over Ethernet standard. The default power budget is 370 Watts and can be expanded to 740 Watts with the DPS-700 RPS. The DGS-3120 xStack Series switches are also equipped with an SD Card slot, allowing the user to boot images and upload configuration files directly from an SD Card. Furthermore, syslog files can also be conveniently saved to a card. The D-Link DGS-3120-48PC/SI is also known as DGS-3120-48PC/SI	or DGS312048PCSI	.